White Keld: Martyn Soliman and Graham Huck (1997-2001). Recently for their 250th edition Descent published an article by Emma Wharton about the recent attempts being made to push White Keld towards Mossdale Caverns and Langcliffe Pot. The first divers to enter and push White Keld were White Rose members Martyn Soliman and Graham Huck. 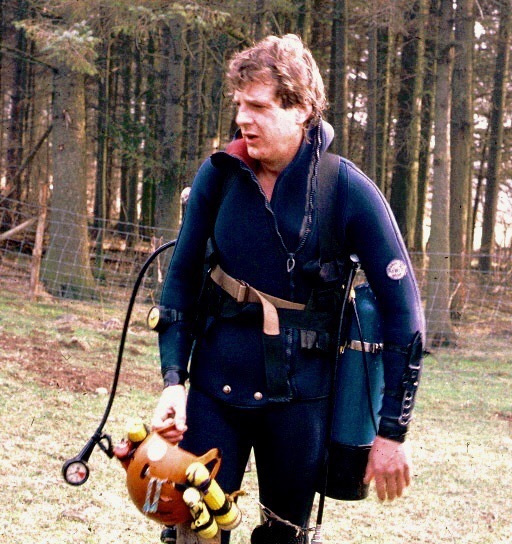 Here is Martyn’s account of how he and Hucky originally unlocked and pushed the system for the divers who followed. 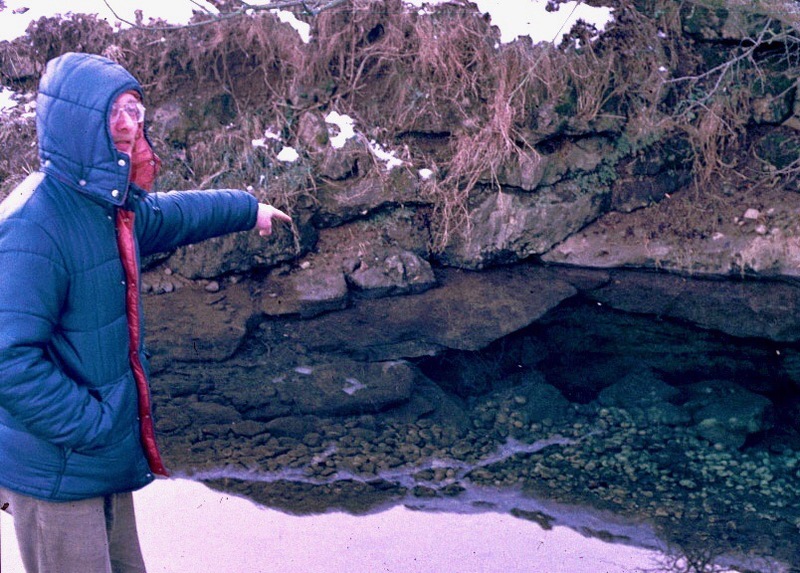 During the winter of 1997 I was invited to have a look at a flood rising just upstream of Spring Trap Cave. It had already received considerable attention in opening up the entrance. If anything lay beyond the fissure, it was unknown, thus providing an excellent opportunity to find out. The bedding entrance is a low portal, but soon opens into a more spacious passage, passing over another low section (impervious dolomitic limestone) to drop into a comfortable continuation. The 50m reel was now empty, passage continuing! Connecting a second reel and setting off gave another 30m, then a junction. To the right became too tight after 10m (muddy backwater). To the left ended narrow in a low, passage full of blocks: too heavy to move by hand, and any continuing passage invisible! More dives did not solve anything, it looked terminal. During the summer much thought was given of how to get this stubborn obstacle out of the way. The size of the passage just before the collapse made it impossible to grab anything with two hands. One hand outstretched is practically useless with anything heavy. The problem was compounded by a 90° bend in low section prior to said collapse. A small hand-winch donated by Chris Camm along with a wire strop and a trench prop were all used to gain mechanical advantage and get the “Henry’s” out of the road! Winching from the jammed trench prop was slow to say the least, but things were a moving. Eventually all three were out of the constriction, the way on was open after five hours of tedious to-ing and fro-in. Beyond the choke, 20m of low passage led to a bedding passage 3m wide, 1m high. This was followed over a further low section into another bedding type passage this time 2m high and am wide in places, over a roof fall to a junction. To the left ended in a boulder choke after 20m, subsequently passed after many hours digging, leading to a further 140m of passage to a presently un-passed bedding with something extra lurking beyond. The power of the water in this section of passage is incredible, strong enough to carry a weighted line reel up-hill for 70m! Back in the main passage, 20m beyond the junction, the sump surfaced after a 220m dive from the entrance. Including the loop passage of the left this took the total sump length to 500 metres. Exploring dry passage beyond quickly ended in frustration, a massive collapse directly under an aven, way on protected by a very loose, hanging- death choke. This area was radio-located successfully to the surface. As the “creeping dread” began to fade many days, er…weeks… no, l mean.. months, were spent undermining a way through the floor under the horrendous slabs and blocks that lay above. Using the same hand-winch and trench prop proved invaluable on many occasions. A hand-winch rated at 1000kg will pull at least twice this albeit slowly. Cavities gave way to bits of two-sided passage, other sides rubble, finally a dug out flat-out squeeze led to standing area. The roar of the stream dispelled many primeval fears on numerous trips through this choke and beyond. Dropping back down to water level, leading through to a low slab-strewn shallow stream-way seemed to indicate a route upstream, but “over-tight” amongst the fallen slabs. Water trickling out of a choked sump seemed the only option. Dammed digging again! 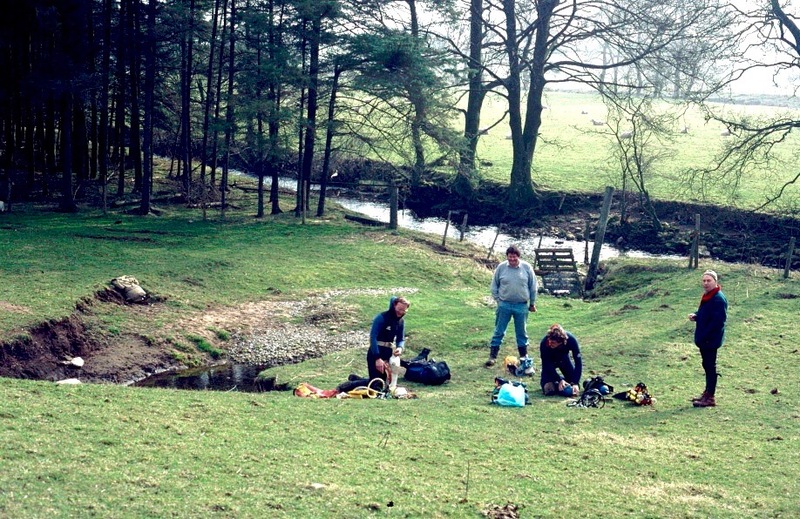 Martyn & Hucky Preparing for a Dive at White Keld with Steve Wiseman and Edward Whittaker (Photo – Steve Warren, 1998). Passing of Sump II, 4m, now by-passable. Low canal, sometimes sumped for 15m led to an impressive aven, climbed for 10m, no escape at top just more choke run-in. Turning right at the aven, a crawl led on to partially abandoned upper series with chambers and pretties in places. A misfit stream-way ran under the rubble floor at one point prior to the final chamber. This was only ever heard in wet weather, probably heading for Spring Trap Cave. The way on at stream-way level remained hidden for some time, finally being found through a flat out bedding, stepping up into a grotesque hidden chamber containing the elusive sump pool, Sump III. The chamber containing Sump III was full of hideous blocks and rubble, the usual collapse features that plague the rest of the cave. Initially the chamber could only be entered via a flat out crawl, then removing debris blocking access to the low chamber. Kitting up to dive the sump was fairly miserable and awkward, so time was spent on another occasion plunging great slabs into the water. One of them definitely looked like the “Titanic” going down. Dived Sump III. This led to a big air-bell after 15m, again the way on was not obvious. Finally found a small slot below the bell, this led to another choked slot which could not be passed. Digging at this eventually broke out into a obstacle & pendant course lasting for 30m to a wide open section “The Ocean” to end after 120m in another cruel, solid boulder-choke! Much searching of the entire sump only revealed a small triangular slot amidst the boulders to the left of the choke. Ascending at this point broke surface after 5m in a cavity with a scree slope to one side. Variable sized stream-way eventually lead to the inevitable Sump IV. A very slippery slope guarded this sump. In wet suit socks an uncontrolled acceleration occurred resulting in a very muddy sump pool. Cautlously setting off through the haze only resulted in a trapped helmet so left it until another time. Following a dry spell, Sump IV was re-visited. The water level had dropped by about lm leaving a low air space canal going off in the distance. Passing this, after 40m broke out into a cavernous passage containing a huge sand bank plus big aven eventually lowering to a sandy bedding crawl containing Sump V. The length of this sump varies considerably depending on weather conditions. 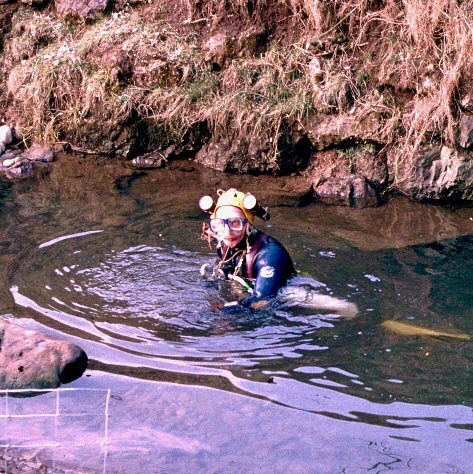 Martyn about to dive at White Keld (Photo – Steve Warren, 1998). Sump V visited on three separate dives. 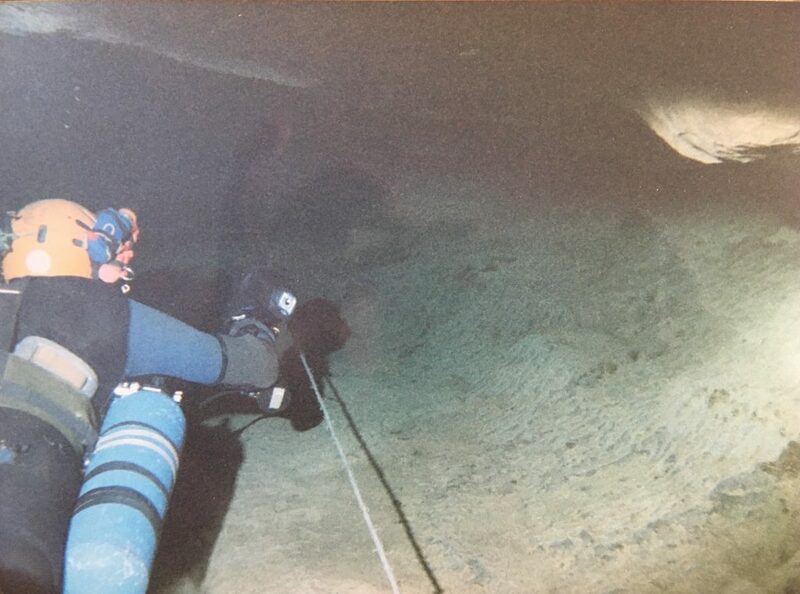 200m of varied diving, passing a huge air-bell “Saturn 5”, then a smaller bell with a “quick-sand ” floor , the sump finally terminating at a slot in the right hand wall, solidly choked at the moment. It is unlikely that the mainstream rises from the choked slot, although a well worn eyehole close by indicate there had been flow at some point in time. 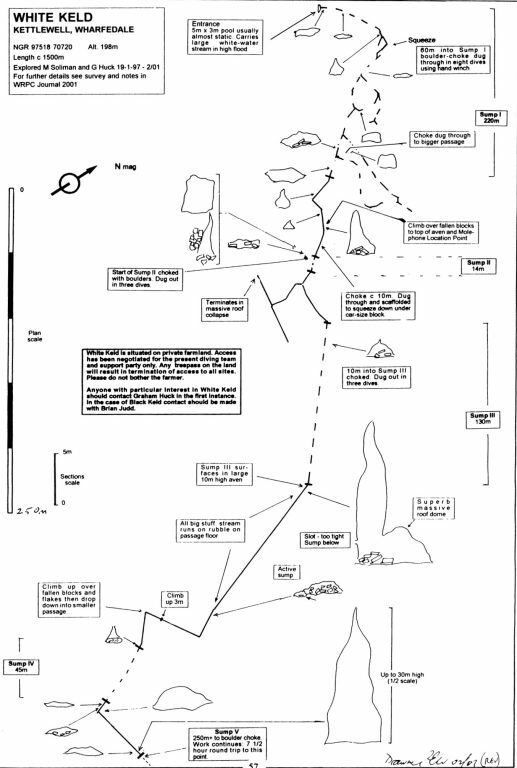 The Survey of the exploration of White Keld carried out by Martyn & Hucky (1997-2001). This is not a fully conclusive account of activities in the system but it contains many of them. Much thanks must go to all who supported this project, especially Graham Huck who carried in on many trips, waited patiently on one side of a sump or the other, and shredded his new wet suit on jagged rock with little sympathy! PS the area in between Sumps II and III leading up to the grotesque chamber is flood prone and too tight to dive. The crystal clear water of White Keld resurging and meeting the muddy water of Black Keld also seen in flood (Photo – Steve Warren, 1998). 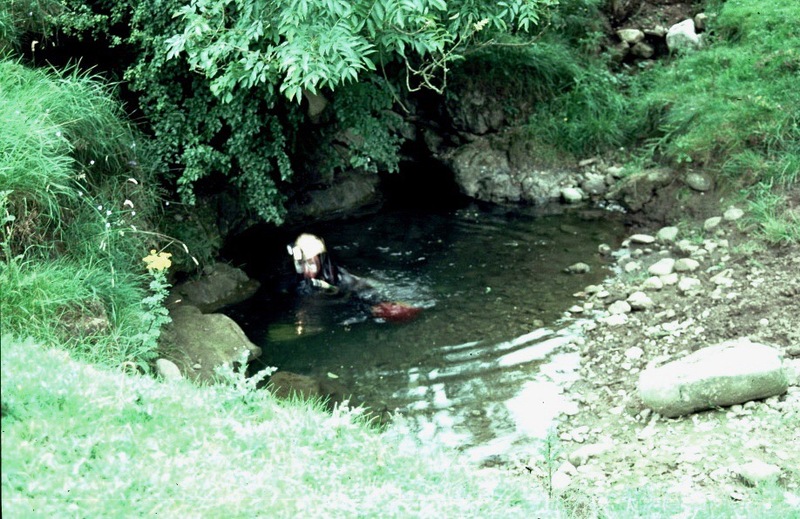 Due to excellent relationships with the farmer Chris Camm, Hucky & Steve Wiseman (Wiz) commenced digging at the rising at White Keld ‘aka the puddle’ in the mid-1990’s. It was in 1996 that Chris finally broke though the rift unlocking the way-on into the first sump of this now extensive system. With digging that opened the system completed the site was handed over to WRPC divers Martyn Soliman & Graham Huck. 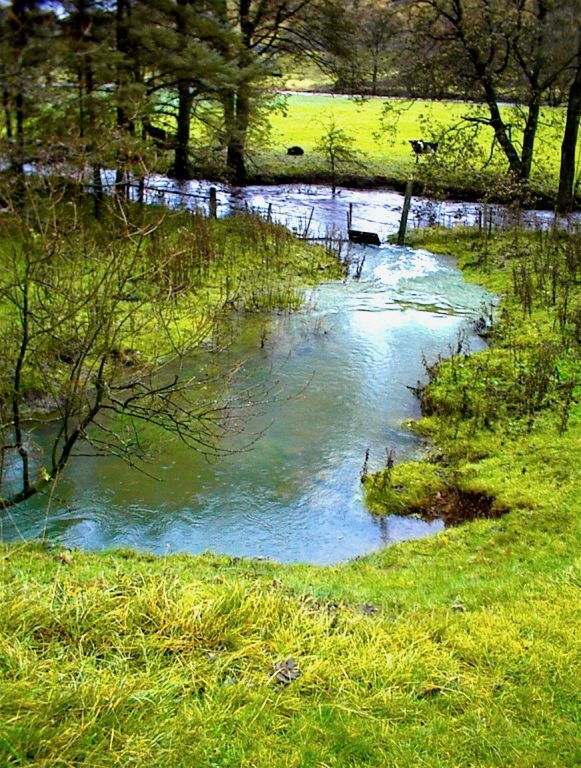 This Article describes the work undertaken by Martyn and Hucky and was Published Originally in The White Rose Pothole Club Journal 2001, p55-7, and titled ‘White Keld aka The Puddle’. Thanks to Phil Ryder for supplying original copies of Steve Warren’s photos from 1998 which accompany this article. Most of these haven’t appeared in print previously and didn’t accompany the original published article.